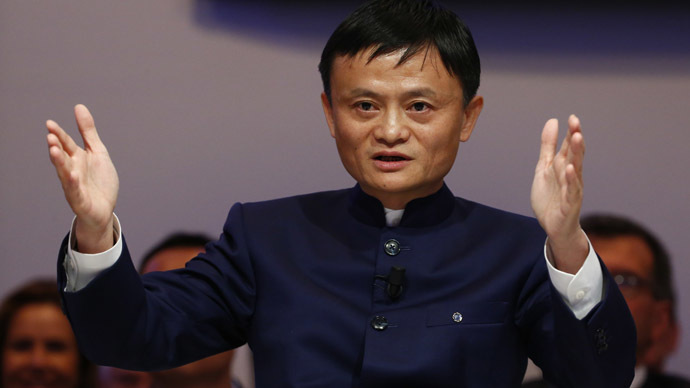 The fortune of Alibaba’s founder and CEO Jack Ma has taken a $1.4 billion hit as its share price fell. The world’s biggest e-commerce company has seen a record slide in revenue growth, and clashed with the Chinese government over counterfeit goods. On Thursday, Alibaba reported below expectation third quarter revenue growth of 40 percent. Alibaba’s revenue was 26.2 billion yuan ($4.2 billion) in the third fiscal quarter compared with the 27.6 billion yuan average of 25 analyst estimates, Bloomberg reports. Chinese real estate and entertainment billionaire Wang Jianlin now succeeds Jack Ma as the country’s richest man in the aftermath of the dive in Alibaba Group’s shares in New York, according to Forbes. Alibaba’s developing confrontation with China’s powerful main corporate regulator over the sale of fake goods is also prompting concerns from investors. Shares fell more than 8 percent to $89.81 at the close in New York on Thursday. This is their lowest since October 2014, the month when the company went public. “The public fight - rare for a Chinese company against a powerful government agency - could pose a risk to shareholders,” Muzhi Li, a Hong Kong-based analyst at Arete Research told the Financial Times. “The government is determined to further escalate this case,” he added. The State Administration for Industry and Commerce (SAIC) released on Wednesday a report accusing Alibaba’s platforms of violating the online business laws and regulations. SAIC claimed only 37 percent of the goods on Alibaba’s online shopping platform Taobao turned out to be genuine. In response, Alibaba accused the watchdog of bias and unspecified “procedural misconduct.” The company announced it would file a formal complaint with the agency, which it claims is trying to damage Alibaba and Chinese online businesses. Jack Ma founded Alibaba in China 16 years ago. The e-commerce giant made IPO history after raising $25 billion and achieving a market value of $230 billion, outstripping competitors Amazon and eBay and making it the world's most valuable technology company.